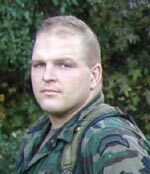 Marc A. Anderson, 30, was from Brandon, Florida, and volunteered for military service with the US Army on July 15, 1998. On March 18, 1999, he was assigned to the 1st Ranger Battalion, 75th Ranger Regiment, at Hunter Army Airfield, Georgia. He earned his Ranger Tab from Fort Benning, Georgia. Anderson was a machine gunner while assigned to the 1st Ranger Battalion. He was killed while fighting the Taliban and Al-Queda during Operation Anaconda, the most intense fighting to date in Operation Enduring Freedom in Afghanistan. He died in combat after enemy gunfire forced down the MH-47 Chinook helicopter in which he and his fellow Rangers were aboard.